“If you would not be forgotten as soon as you are dead, either write something worth reading or do things worth writing,” wrote Benjamin Franklin. He certainly did both, becoming the most accomplished American of his age and the most influential person in creating the type of society America would become. During his 84-year life, Franklin rose from runaway apprentice to become America’s best writer, inventor, media baron, scientist, diplomat, business strategist and favorite Founding Father. 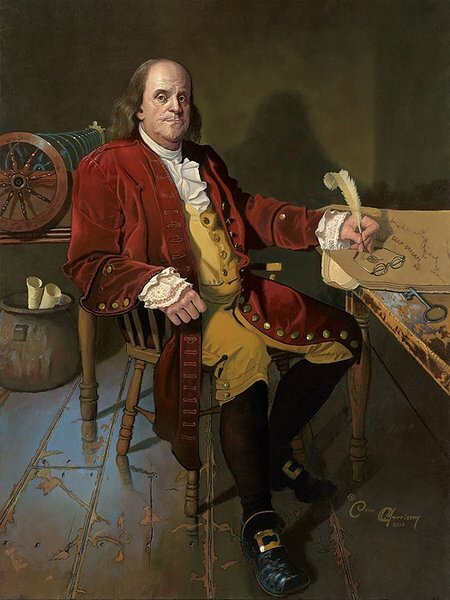 Dean Morrissey’s portrait of Franklin depicts the great statesman with a few of his well known inventions and inquiries. Behind him is his Glass Armonica, a musical instrument comprised of thirty-seven glass bowls mounted horizontally on an iron spindle. The whole spindle turned by means of a foot pedal. The sound was produced by touching the rims of the bowls with water moistened fingers. Each rim was painted different color according to the pitch of the note. He is working on is his map of the Gulf Stream, which he was the first to chart and name. He noticed that mail packets sailing from England would often take weeks more to make the same trip as a merchant vessel. After consulting with experienced ship captains he created his chart so eastbound ships could avoid sailing against the three miles per hour current. The key is from his experiment to prove that lightning was, indeed, electricity. In a letter describing the 1750 experiment he noted, “When rain has wet the kite twine so that it can conduct the electric fire freely, you will find it streams out plentifully from the key at the approach of your knuckle.” He was also proposed that what was then known as “vitreous” and "resinous" electricity were not different types of "electrical fluid” (as electricity was called then), but the same electrical fluid under different pressures. He was the first to label these as “positive” and “negative” flows. He is known as the father of the bifocal, because of a famous drawing he made of his glasses in 1784, but there is much evidence that he had created them long before that. As early as 1775 the Philadelphia optician who made his glasses references bifocals in his writings and a 1779 letter and bill from his optician in Paris, France apologizes for the delay in delivering his order because he broke numerous lenses while cutting, not grinding, the glass. Dean Morrissey’s "Ben Franklin: Patriot and Renaissance Man" celebrates the intelligence and natural curiosity that drove Franklin’s search to continually discover ways to make things work better. It was only natural that when such a great and energetic mind focused on the problem of colonial exploitation such great things would come to pass.